Cortés & Pizarro - There was a fundamental difference between European nations on how they colonized the Americas. While the Dutch, the Portuguese and the French all had a significant presence in the New World, it was the Spanish and the English whose impact is most widespread and enduring. The English preferred to settle the land, building self-sustaining colonies that eventually grew into their own economic centers. The Spanish, by contrast, were more exploitative, choosing to harvest the wealth of the land and ship it back home. As a result of these two approaches, it was the English colonies which tended to become more prosperous. Today, the United States, which began as thirteen English colonies, is the wealthiest nation on earth. But at the time of colonization, exploitation resulted in short-term benefit for Spain. The 16th century was the time of the Spanish conquistadors (conquerors). 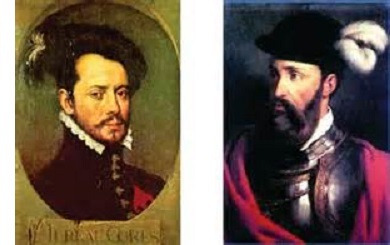 Chief among them were Hernán Cortés and Francisco Pizarro. Many do not realize the two men were second cousins (I didn't). But both were successful (the most successful of the conquistadors) at completing the missions they set out to. With inferior numbers, each separately brought down the two most powerful empires in the New World at that time. Cortés (1485-1547): Cortés conquered the Aztec Empire in present-day Mexico. He was a restless soul in Spain who was anxious for a life of adventure. So in 1504 at the age of 18, he hopped a ship and traveled to the New World, settling in the colony of Hispaniola. In 1511 he joined an expedition, led by Diego Velázquez de Cuéllar, to conquer Cuba. De Cuéllar had been a crewman on Columbus' second voyage and settled in Hispaniola himself instead of returning to Spain. He became governor of Cuba upon its acquisition and made Cortés his personal aid. Cortés saw the position of power that de Cuéllar had attained by conquering Cuba, and he became anxious to do the same. So when another conquistador, Juan de Grijalva, established a new colony on the mainland in early 1518, Cortés decided to take advantage. A new expedition was chartered toward the end of 1518 to explore the region surrounding the colony. Cortés was appointed to lead the expedition, which he accepted enthusiastically. Perhaps too enthusiastically. Because de Cuéllar became suspicious of his motives and revoked the charter. However, Cortés had already assembled eleven ships and 500 men, and managed to launch in February 1519 before the order to replace him could be carried out. This was considered an act of mutiny. He landed on the Yucatan Peninsula in March, and by a stroke of good fortune, came upon a Franciscan friar named Geronimo de Aguilar. De Aguilar had survived a shipwreck, but had been captured by the local Mayans. He escaped, but not before learning their language. Thus he was able to serve as Cortés' interpreter. They began their march toward Tabasco, the colony founded by de Grijalva (today Tabasco is a state within Mexico, named for that colony). Along the way, they encountered a band of natives and were attacked (or attacked them). The Spaniards were victorious and captured 20 females. One was a woman named La Malinche. She spoke both Mayan and Nahuatl (the language of the Aztecs). It was through her that he learned of the great Aztec Empire that lay inland, and could now speak with the Aztecs thanks to both La Malinche and de Aguilar. Cortés sailed for the eastern shore of Mexico and landed at Veracruz in July, 1519. He then scuttled his ships as an incentive for his men. It was succeed or die; there was no going back. 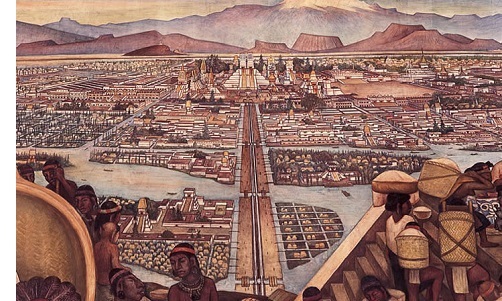 As he approached the Aztec capital of Tenochtitlan, Cortés made alliances with other native tribes who had either been conquered by the Aztecs or were at war with them. By doing so, he gathered valuable intelligence and strengthened his own army, which consisted of about 600 Spaniards, 15 horsemen and 15 cannons. On November 8, 1519, Cortés entered Tenochtitlan and was greeted by the Aztec ruler (tlatoani) Montezuma. One of Cortés' men, Bernal Díaz del Castillo, described the city as being so large and splendid, that many of the men acted as if they were caught in a dream. Montezuma welcomed Cortés into his palace and left him remarkably unguarded. Cortés later claimed in his correspondence to King Charles that Montezuma believed Cortés to be the Aztec god Quetzalcoatl, or at the very least, his messenger. This allowed Cortés to take Montezuma captive and issue orders to the Aztecs through him. Meanwhile, Governor de Cuéllar of Cuba dispatched a fleet of ships with over 1,000 soldiers on orders to arrest Cortés. When Cortés learned of this, he left about 200 men in the city and took the rest to intercept the force coming for him. Despite inferior numbers, he managed to ambush de Cuéllar's army and defeat it. It's not certain how many died, but those who lived joined Cortés. He returned to Tenochtitlan to find the city in chaos. 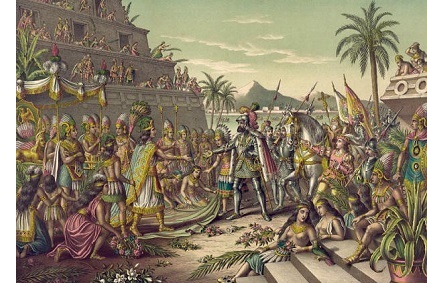 Montezuma had been killed (by the Aztecs according to the Spanish, and by the Spanish according to the Aztecs), and Cortés' men were under attack. They chose to flee, but most of them were massacred in the retreat. However, Cortés survived along with a few hundred men and they made their way to Tlaxcala, the city of one of their allied tribes. 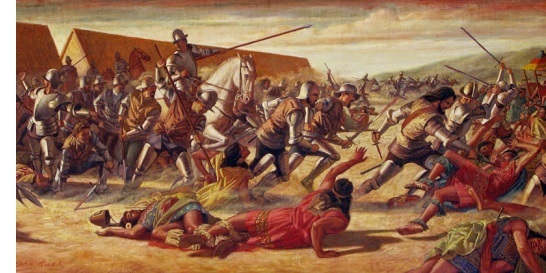 After being reinforced by more men from Cuba as well as thousands of native soldiers, Cortés returned to Tenochtitlan in May 1521 and surrounded it, cutting of its supplies. After a two and a half month siege, the city was starved out and Cortés entered it victorious. The city was largely destroyed and renamed Mexico City. The Aztec Empire was ended and Cortés became the first governor of Mexico, a position he held until 1524. Pizarro (ca. 1476-1541): Twelve years after Cortés conquered the Aztecs, Francisco Pizarro did the same to the Incas. He arrived in the New World in 1509 and was a member of Balboa's expedition which discovered the Pacific Ocean. At the same time Cortés was campaigning in Mexico, Pizarro was mayor of Panama City. News of Cortés' success, and rumors of another great empire to the south, peaked Pizarro's interest for an expedition of his own. After two failed attempts to reach Peru in 1524 and again in 1526, he made plans for a third try in 1530. On his second attempt he managed to reach the northern fringes of Inca territory and saw some of the wealth the people possessed. This served as motivation for a third attempt. However, the governor of Panama, Pedro de la Ríos, refused to fund another campaign. So Pizarro appealed directly to King Charles who agreed to sponsor a third expedition. It began in 1532, when he landed on the coast of Ecuador with about 200 men. Among the party was Pizarro's brother, Hernando, as well as Hernando de Soto (who later discovered the Mississippi River). After a two month trek, he reached the Incan capital of Cajamarca. The ruler of the Incas was a man named Atahualpa. Pizarro asked for a meeting with him. But Atahualpa ignored the request. With an army of about 80,000 soldiers at his disposal, he felt there was little to fear from a force of only 200. Unlike Montezuma of the Aztecs, Atahualpa never viewed the Spaniards as gods. If anything, he took them too lightly. Many historians believe Atahualpa was over-confident, which contributed to his own destruction. Finally on November 16, 1532, Atahualpa came out to meet the Spaniards carried on a litter. Pizarro's friar, Vincente de Valverde approached Atahualpa carrying a Bible and attempted to convert him to Catholicism. However, Atahualpa grabbed the Bible and threw it. Valverde took this as a rejection and gave a shout to the Spaniards. Fighting broke out and the Spanish soldiers, armed with guns (and a cannon) and about sixty mounted on horses, mowed down thousands of Incas. The Incas, having never before seen guns or horses, were inexplicably unarmed and offered almost no resistance. Atahualpa was captured and taken prisoner. The conflict is now known as the Battle of Cajamarca. Pizarro promised to free him in exchange for a huge ransom. The Incas filled an entire room with gold and silver, making the Spaniards instantly rich. Pizarro reneged on his promise though and executed Atahualpa. His brother, Hernando, and de Soto both opposed it, arguing Pizzaro did not have the authority to execute a ruler. And when King Charles learned of this he rebuked Pizarro in a similar fashion. Cajamarca had only recently become the Incan capital when Atahualpa overthrew his brother, Huáscar in a coup. Before then, the city of Cuzco served as the capital. So a year later, Pizarro invaded Cuzco and conquered it, thus bringing about an end to the Incan Empire.